You've probably noticed I haven't had much to say in the last few weeks. It's not for lack of blog fodder. Rather it's more about trying to duct tape the pieces of my exploded head back together. But hey. THREE ENTIRE DAYS have passed without anything randomly shattering, breaking, getting decapitated, celebrating a birthday on a horrible no good very bad day, having an operation or getting maimed at school. In the span of nine freaking days my dog died on my son's birthday, my other son celebrated his birthday on the day another of my son's died, my rear windshield spontaneously combusted, my husband is bedridden and my daughter is broken. It's like I pissed all the Gods off and they've decided to turn my life into some poorly written country music song. Too bad I don't own a guitar and I shaved most of my hair off. I could have been the next Patsy Cline. It was a bad couple of days. Boo was scheduled to have some minor surgery last Wednesday and like the naive dumb fools we are, we walked into that hospital thinking life had crapped on us enough already, there was no way anything else could go wrong. After all, this was just going to be a minor orthotic procedure. You know what happens when your husband breaks his ankle months and months and months ago and mostly refused to wear his soft cast and then puts off having his ankle surgically repaired so he can build the behemoth we lovingly refer to as the Zeppelin hangar? Nothing good, I assure you. So my husband's simple day surgery didn't go as planned. Oh sure, he flirted with all the nurses while his hospital gown kept showing off our family's jewels and we were sent on our merry way fast enough, but that quick recovery after a minor surgery he was supposed to have? Foiled by what turned out to be major reconstruction work. Suddenly my husband is taking up all the space on my overstuffed and ugly leather sofa, he's hogging the television remote, he's watching SOAP OPERAS and I'm starting to worry he's never ever going to return to work. In fact I believe he's plotting on driving me insane in the mean time. Too late Boo. I'm already crazy. It's part of my charm. The stress of the past week and then my husband's surgery knocked whatever wind I had left in me right out. I fell face first into my pillow that night and didn't wake up until the phone started ringing the next morning at about 10:30 am. Realizing my husband wasn't about to hop up and answer the phone, I looked at the clock, cursed and then ran to catch the call before it went to voice mail. Panting, I answered that phone in a voice that clearly advertised the fact I had just woken up, and listened to the school secretary inform me my daughter had been in an accident and would I like to take her to the hospital or should I just meet her there? The joy I felt at knowing I got to rush back to yet another hospital was overwhelming. 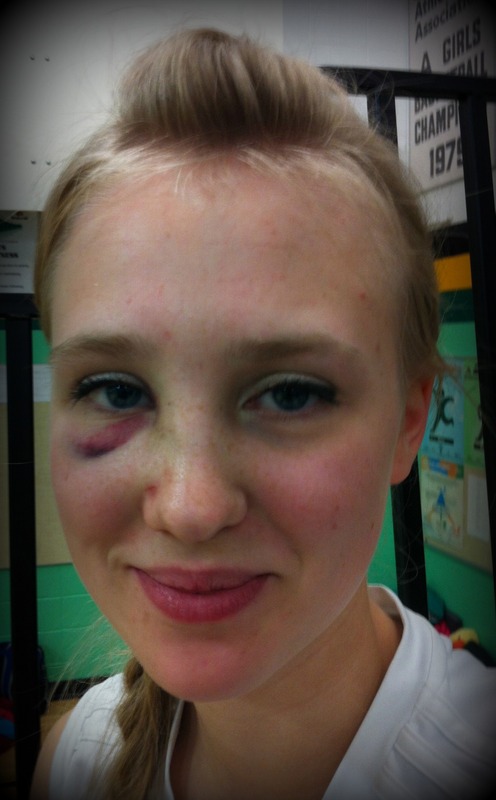 It almost as fun as the moment when my heart stopped dead upon hearing, "It appears she was hit in the face by a puck. It's hard to tell. There's a lot of blood." And then, as an after thought, "But she totally took it like a champ! No tears at all." Aw, that's my kid. You can beat her up but you can't make her cry. I'll totally bask with pride over this irrelevant and unimportant fact. Don't judge me. As it turned out, Fric wasn't hit in the face by a hockey puck. Thank God. No, it was only her face meeting the business end of a hockey stick. Whoops. Yesterday's nose. We're down to one black eye now! Progress. I'm still calling her Bruiser though. After her x-rays clearly showed what her flattened nose already reflected, we sat inside the doctor's office and the doctor noticed one of us was crying and it wasn't the kid with the broken face. I may have been having a hard time coping with stress at the moment. I'm not Superwoman (or Fric) after all. Everything finally caught up to me. My dead dog. My dead kid. Every bad thing that happened finally just got the better of me in that moment. And to be honest, my kid's lack of a nose bridge was really freaking me out. But all of this was last week and it's been three whole tragedy and accident free days since. Plus my kid's nose has sort of popped back up. Perspective has suddenly flooded back. Both my husband and my kid are healing. One more gracefully than the other, *cough*Fric*cough*. My windshield was replaced, my flowers fertilized. It could be worse. That's what I told my daughter this morning as I drove her to school. "It could have been worse. You could have lost an eye. Or your teeth! Or both! You could have been the one eyed toothless girl wandering your school halls. Noses will heal!" Look at me! The picture of grace and optimism! My daughter just gave me a look. "Don't look at me like that. Life is good! One day soon your nose won't be on the wrong side of your face anymore!" Life. It's all about keeping perspective. And learning how to avoid errant hockey sticks to the nose.